What is yours and what is not? This quote isn’t about second guessing a gut instinct or questioning your intuition but this quote speaks volumes to me about imprinted belief systems and understanding our truth. I can recall hundreds of instances when I thought or felt something in response to an encounter or a conversation and then immediately adjusted or changed that thought/feeling. I’ll provide an example. Not long after 911, I was boarding a flight to San Fransisco. As I took my seat, a tall middle eastern man wearing a turban walked onto the plane and opened the overhead bin for his carry-on bag. I instantly felt a sense of fear. As I recall the feeling today, it was more suspicion than fear but nevertheless, born in fear. I was immediately disgusted with myself. Where did this bias come from? When did I become so narrow-minded and suspicious of an entire set of people? Was it the media? Was it 911? Was it justified? The answer to my last question is no. Where is this shame coming from? He explained to us that our church was a “white church” and that my friend, who was black, has her own church. I was instantly ashamed. I felt I had disappointed my beloved reverend. And then I was mad as hell. That initial feeling of shame quickly turned into anger. Another example goes even deeper. When I was 9 years old, I lived in the South. Segregation had been abolished less than a decade before, but I lived in a town that was slow to make changes. My school still had separate water fountains and bathrooms for blacks and whites. As a child, I found this odd but didn’t question it, it was our “normal”. In those days, attending church 3-4 times a week was also considered normal. Listening to the word of God and revering our pastor and his sermons was an unspoken expectation. That summer, I invited a friend to vacation bible school. I was so excited to bring her to the opening day festivities and to share my beloved church with her. As all the children lined up to enter the sanctuary, my pastor approached and asked me to accompany him to his office. I was excited by his request because I loved my pastor and felt special that he wanted to talk to me. I grabbed my friend’s hand and proudly walked with him past all the other children. When we reached his office, his demeanor changed from happy to sad. He explained to us that our church was a “white church” and that my friend, who was black, has her own church. I was instantly ashamed. I felt I had disappointed my beloved reverend. And then I was mad as hell. That initial feeling of shame quickly turned into anger. Even at my young age, I recognized the hypocrisy and it enraged me. This was my first experience with injustice and I railed against it. What experiences have you had with imprinted beliefs? Have you ever automatically thought, “I don’t deserve that” and then instantly told yourself you do? Have you ever experienced fear, shame, or defeat and then rejected that thought/feeling or belief? Beliefs are as necessary to us as our physical organs. We cannot exist without them. We need them as parameters to interpret what is happening in our life. One could never be without beliefs, nor would you want to be. What you do want, however, is to consciously decide the beliefs you want working for you. To choose the lens you will view the world through. When you’re thinking about the past or imagining the future, both these actions happen in the present. When you act upon your life, it takes place in the present. In fact nothing you can do will ever happen outside of the present. So choosing in the present to re-frame your past and future is incredibly powerful. Well, can you recall your ABC’s? How is it that you are able to sing the Alphabet song no matter how many years it’s been since you first heard it? What about multiplication? How is it that you automatically know that 2X2 equals four without having to think about it? Will you ever forget? No…because these and many other things have been imprinted upon you. You need not practice them or refresh yourself – they are there for life. You can do the same thing with beliefs. What you have done with the multiplication tables can also be done with new beliefs you wish to permanently imprint into your consciousness. The process is exactly the same, and the repetition equally important. For five or ten minutes a day concentrate your attention as vividly as possible upon one simple statement. Choose carefully and decisively. Feel the power and implication of what you are saying. Let it become alive within you. Repeat it over and over, allowing your mind to absorb its message. Claim it as yours. 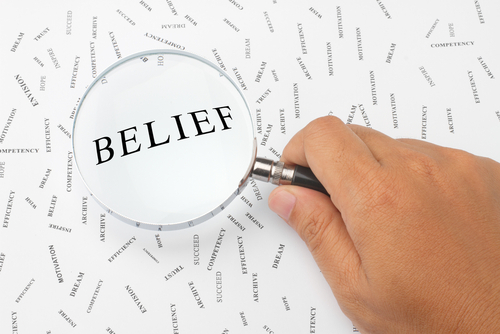 If countering thoughts or old beliefs creep in, banish them as false and continue focusing on your new belief. Responding to your new beliefs in this way is sending a strong signal to your subconscious that new realities are beginning to take hold, that you are willing to change, that you are cooperating with the process, that it is in fact already happening. The initiative must come from you. Challenge yourself to find ways to demonstrate your changing reality. Your present is now. Your new beliefs are here and now. Kelly Stroud is a guest teacher and blogger on Soul Searching Zone and often collaborates with Kelly T Smith on projects and spiritual work. She is a Clairvoyant, Intuitive Healer, Medium, Life Coach, Reiki Practitioner, and Hypnotherapist. After 25 years of leadership roles in Corporate America, she was able to combine her love of people along with her coaching and teaching skills with her intuitive gifts and desire to make the world a better place. Follow Kelly on her Facebook Page for more inspiration and blog posts! I have slowly been making your readings apart of my mornings, however I have a problem with my Christian upbringing. You know the old saying, “If you are doing something you dont really want your folks or Pastor to know about you are probably sinning so stop it!”. Well thats where I am concerning your readings. They make since to me, but how would I feel about bringing you to meet the family and pastor? Got any ideas about this?